WIT -Insula Candia Ejusque Fortificatio. WIT, F DE - Insula Candia Ejusque Fortificatio. Title : Insula Candia Ejusque Fortificatio..
Map maker : WIT, F DE. Size : 18.1 x 21.7 inches. / 46.0 x 55.0 cm. 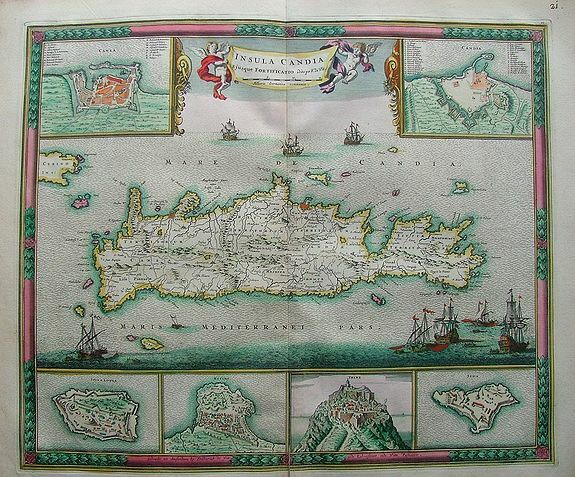 Description :Nice map of Crete (candia) with inset maps of Canea, Candia, Suda, Thise, Retimo and Spina Longa in an unusual fresh color. Condition : Very nice bright colors and print. Split in lower part of centerfold, 3 cm into the engraved area.